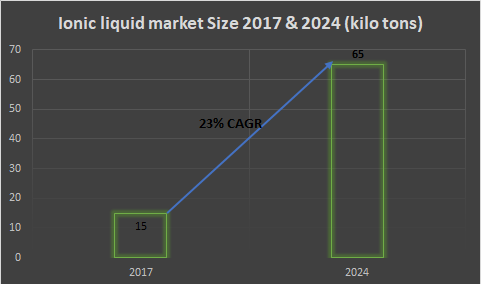 Global ionic liquids market size is predicted to reach over USD 2.5 billion by 2024, owing to its growing demand in food, electronics, pharmaceuticals, catalysis, automotive, paper & pulp, and biotechnology applications. Growing demand for green solvents due to ecological and toxicity concerns is predicted to boost the industry growth trends. Outstanding features of ionic liquids such as low vapor pressure, non-flammability, low combustibility, and high thermal stability has boosted its demand across various sectors. Chemical reactions like Diel-Alder reactions and Friedel-Craft reactions are carried out by using ionic liquids as solvents. Ionic liquids industry size estimated at over 15 kilotons in 2017, is predicted to surpass 65 kilotons by 2024, growing at a CAGR rate of around 23% over the period of 2018-2024. Growing preference for green solvents due to environmental impacts and toxicity issues is predicted to fuel the growth of the industry over the next eight years. Ionic liquids such as ammonium, pyrrolidinium, sulphonium, and imidazolium are preferred in various industrial applications due to their inherent features like low combustibility, low vapor pressure, non-polarity, and thermal stability. However, toxicity concerns due to the release of a few ionic liquids like tetraalkylammonium and N-alkylpyridinium polluting water or soil and causing ecological damage can hinder the market growth over the forecast timeframe. Ionic liquids market is segmented in terms of applications and regions. Catalysis application segment worth over USD 170 million in 2017 dominated the application segment and is predicted to witness a noticeable growth over the forecast timeline. Food application segment accounting for over 12% of the global ionic liquids market share in 2017, is predicted to witness a substantial surge over the next eight years. Factors such as growing demand for processed foods due to the hectic lifestyles and enhanced purchasing power of consumers is predicted to increase the preference for ionic liquids across this segment. Electronics application segment is expected to witness a substantial growth over the forecast timeline, owing to use of ionic liquids as an electrolytic medium in lithium-air and lithium-ion batteries for these applications. Pharmaceuticals applications segment is anticipated to grow at over 25.5% over the period of 2018-2024. U.S. ionic liquids market size worth USD 320 million in 2017 led the North American industry and is predicted to witness a substantial growth over the forecast timeline. Strict legislations over the use of organic solvents in chemical, electronics, oil & gas, and pharmaceutical industries as well as rising health & toxicity concerns are few of the factors anticipated to fuel the regional growth. China ionic liquids market is predicted to grow at over 24% over the period of 2018-2024 due to surging demand for green solvents over its organic counterparts, the latter being a major cause of environmental pollution. Key industry participants include BASF, Strem Chemicals, Solvionic, Scionix Holland B.V, Wuhu Huaren Science and Technology Company Limited, IoLiTec-Ionic Liquids Technologies GmbH, and CoorsTek Specialty Chemicals.